Video courtesy of Keith Quarrier who used to build these fantastic boats. The St. Lawrence River Skiff (SLRS) is a guide's boat indigenous to the Thousand Islands Region of NY, emerging on both sides of the river around Clayton and Alexandria Bay, NY in the late 1800s. Its hull form evolved and became the standard river boat of its time. Guides had to row, all day, paying clients who wanted to productively fish the River. A guide might row 20-30 miles in a single day! The boats had to be stable, easy to row, and able to take all the conditions thrown at it in a day on the river. Today, families still row their Skiffs on the River for pleasure, picnics, and fitness. The easy-pulling nature of the Skiff even at maximum capacity makes them perfect for bringing the family out on a cruise or to an island picnic. The flat, plank keel make them easy to beach and sit up right at the boat house. Some Skiffs could be sailed and some of the boats specifically carried a centerboard, but the Bobby does not have a centerboard and shouldn't. Bobby will excel at sailing downwind much like the Drake Rowboat. The other models could also sail downwind with a small lug or spritsail. Resist the urge to use a leeboard or centerboard. These add slot drag and complication. Row upwind; sail down. The Antique Boat Museum in Clayton houses a fleet of Skiffs and holds the plans for a half dozen Skiffs, several of which were drawn by fixed-seat rowing guru, Andrew Steever. The ABM exhibit documents the emergence of the craft and evolution from utility to pleasure boat to racing boat. The Frye Skiff is the smallest of the SLRS's and is offered as the ultralight, cartopper of the bunch. She is ideal as far as offering good performance in a shorter boat...any longer and cartopping is tough; any shorter and you really lose the glide in your rowing stroke. The Frye can safely carry another adult with a maximum capacity of about 325 lbs. 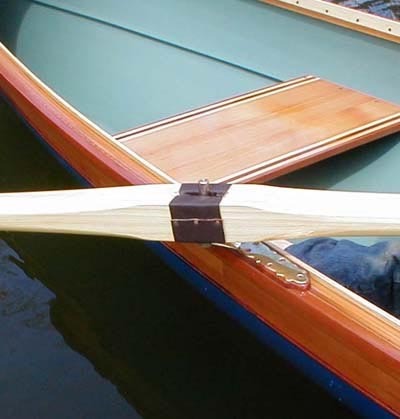 She features a beautiful shape in the stern that will provide absolute pleasure when rowing. The finer stern keeps her tracking gracefully. This hull is true elegance as far as the St. Lawrence SKiffs go. The original Fry Skiff at the Antique Boat Museum in Clayton, NY. The Fry would make a perfect ultralight, cartopper. We need to line it off for 4mm ply-lapstrake planks and kit that. Click here to help. The Fry was strip-planked over CNC cut molds, turned over, then fiberglassed inside. Plans are not available at this time, however plans for the traditional boats are through Mystic Seaport and Antique Boat Museum. For pricing on kits and ordering, visit the Pricing & Ordering page. Some of the SLRS kits are still in development, but please do inquire. The first Fry Skiff completed by Old Wharf Dory Co. 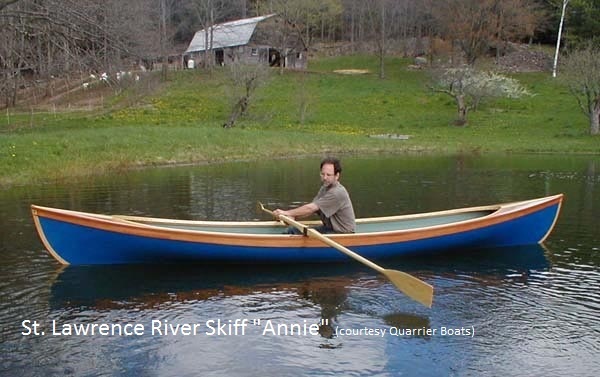 Many Annies were built by Quarrier Boats in Alstead, NH by Keith Quarrier who grew up visiting the Thousand Islands Region with his family and who maintained and restored many Skiffs over the years. 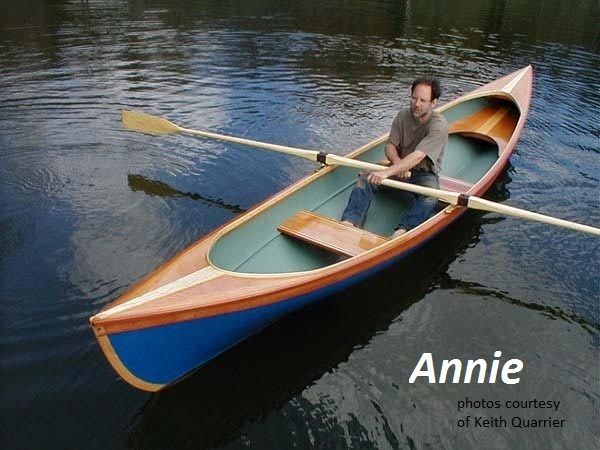 The Annie model is a classic one: stable and fast she has won the Blackburn Challenge and finished races at the top with her Adirondack Guideboat competitors. Annie can safely take two other adults aboard with a maximum capacity of about 425 lbs. In SLRS fashion, the solo rower sits on a wide thwart in the middle of the boat facing the stern. 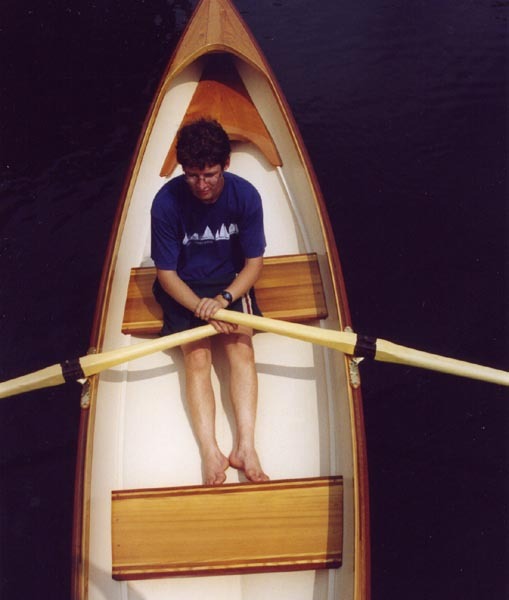 With a passenger aboard, the rower turns around, facing the bow and sits in the stern seat. This rowing arrangement allowed the guide's to take guests and maintain a properly trimmed hull. Bobby is the longest Skiff of the bunch and features a symmetrical fore and aft making her a true double ender. 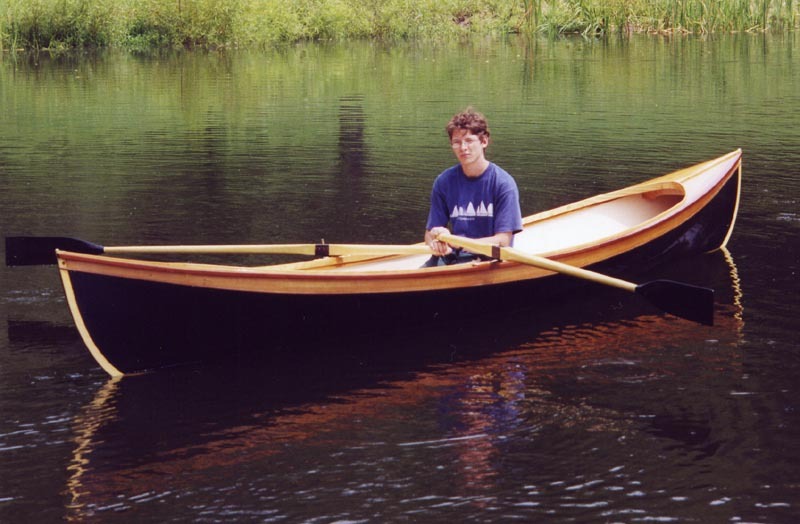 For tandem rowing and camping along the Maine Island Trail this model would be ideal because of the 720 pound capacity and its long waterline length. Yet, the boat is light enough and easy enough to row for one rower with or without a customer. I personally own a Bobby hull and greatly look forward to finishing her and rowing her on the Saco River and the Bay. The Bobby-Lynn can also be lined off for plywood-lapstrake planking. Click here if you are interested and want to help. I collaborated with small craft guru and engineer David Cockey to model the hulls. We took the Steever plans from ABM input the offests into Rhino, a 3D CAD program. The hull surface is modeled to a high degree of fairness and accuracy. One of the intricacies of the Skiffs we "fussed" with is the hollow in the garboards in way of the keel and the notable hollow in the waterlines fore and aft. 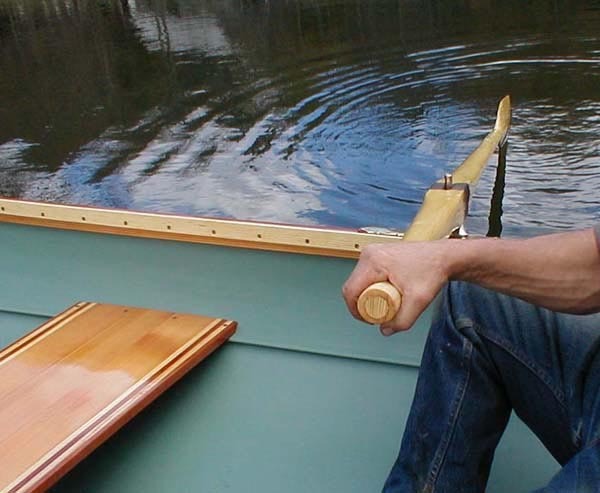 The Skiffs all feature a slightly finer waterline in the stern than in the bow. It is believed that this is feature that came from the Birch Bark Canoes which may have strongly influenced the Skiff form. At speed, a finer hull aft trims the boat down at the stern and helps the boat track straighter. Then the hull is sliced and diced into horizontal and vertical slices called waterlines, buttocks, and station sections. The station sections become the shapes that are used to cut the molds. The shapes are flattened onto a 2D plane and then "dropped" into a 4x8' recatangle representing the sheet of 3/4" MDF or plywood. At the CNC machine shop, the operator programs the machine to cut to the geometry I give them in the form of a nesting file. 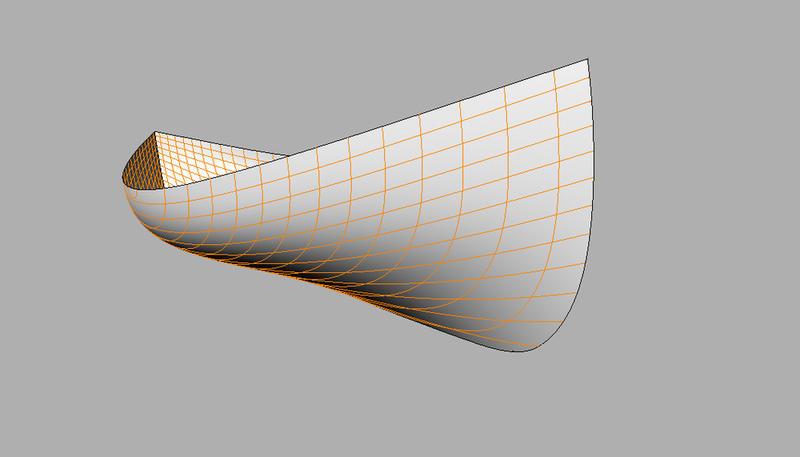 Their cut file gives the machine the x-, y-, and z- coordinates for every point along the curve. The result is a mold cut to within 0.003" (three thousandths of an inch!) tolerance. These cut files are the keys for the mold kits to each Skiffs. 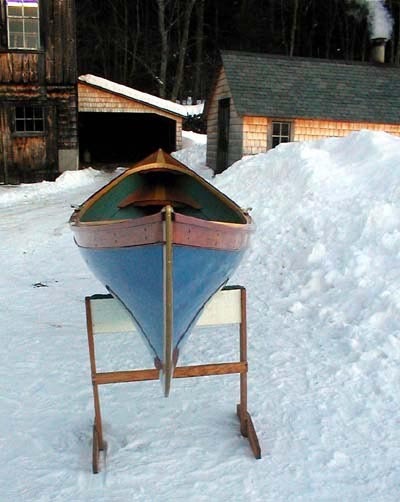 The Skiff kits were cut at Hewes & Co. in Blue Hill and built at WoodenBoat School by my students in the Strip-Composite course that I teach. 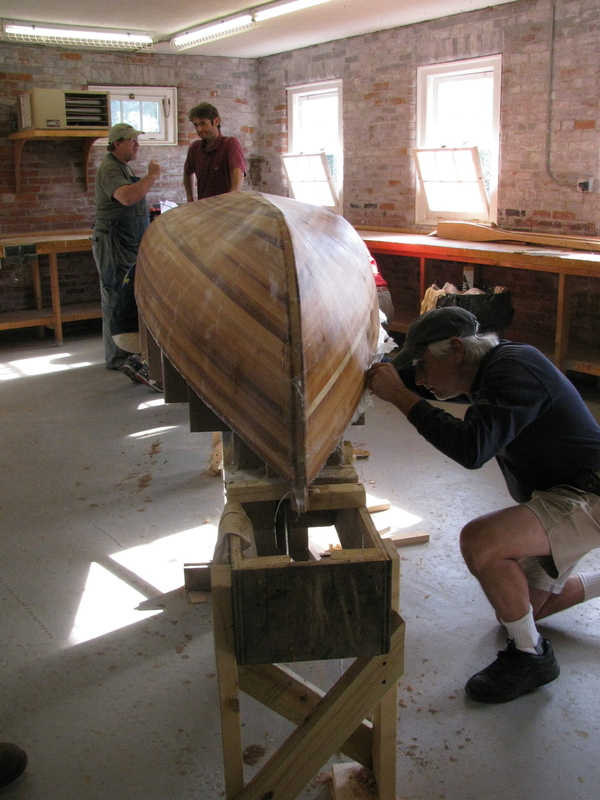 Over a single week, students set up the molds, strip planked the hull, and sheathed the hull in fiberglass. The kits are available for those who want to make their own strip-built boat. I hope to have plywood lapstrake kits also available.